Copy The Pro Scam-Binary Options Review!! | Alert! 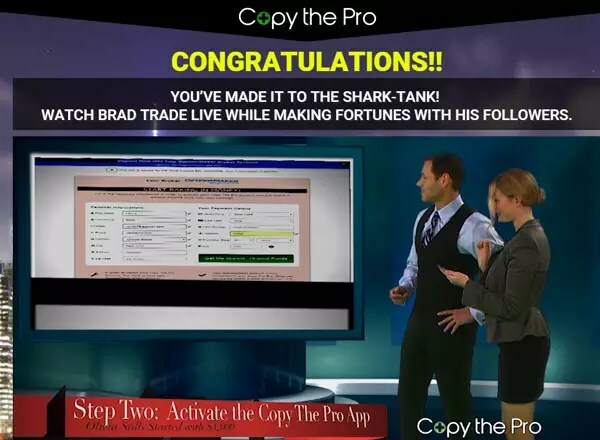 Copy the Pro App is a laughable scam which came to light in the binary options world recently. The Doctor received an unsolicited email grabbed his Doctor’s bag and went straight to work. After close research, the Doctor has determined that Copy the Pro App is a plague that needs to be wiped out of the binary options world immediately. Let the Doctor put this website under the microscope and tell you about this new plague on humanity. Once you click on the website via your email or any other link, you are taken to a webpage with a huge city background and video to click on. Once you click the video a man working with a green screen background of an office comes on and tells you all about Brad Christian. You ask, who in the heck is Brad Christian? Let the Doc tells you all about Brad Christian. Apparently Brad Christian is a money-making machine and trades with an 84% win rate. Holy cow! Watch out the world. Brad’s gonna own you any minute. At least that’s what the Fiverr paid actors to have to say in the terribly boring video on this website. And while you watch these fake testimonies, you have to read a banner at the bottom of the page which says, Watch Brad Christian Trade live and profit with amateurs on Copy the Pro. Enter your name and email to enter the Shark Tank. What does a shark tank have to do with it? Well, O’ Doc has an idea. A pool shark is one who tricks you into believing they are terrible at pool. Then turn around and take all of your money. To the Doctor, that’s exactly what Mr. C is doing. Tricking anyone who will fall for it, into giving him your email address and your name. After Googling, many of the pictures to find in different stock photo’s, O’ Doc decided not to take the bait to see what would happen in the Shark Tank. From other reviews, nothing happens other than you are redirecting to a scam broker and asked to make a deposit and start trading through them. Face it, that’s pretty much how most binary options scams work. Copy the Pro is obviously a scam. Watch multiple reviews on YouTube see just how fake they are. O’ Doc gives this Scam site 10/10 hilarious stitches for even being published. If any of our subscribers click on the link to this scam; shame on you. But please read our review before joining the scam that is Copy the Pro. Review Conclusion: Copy The Pro is a SCAM. Gordon here. I was scammed by this Copy The Pro software and lost 3k. Wish I could read this article before joining. Thank you Admin for the useful Article.